We’re creeping slowly eastward thru the Adirondacks. Autumn has a firm grasp here – nights are cold, and the days are crisp and sunny. We’ve had no phone service or wi-fi for four days now (or electric power for that matter), so many of the stories we had to tell have already faded. Guess that’s why people keep journals and blogs, right? 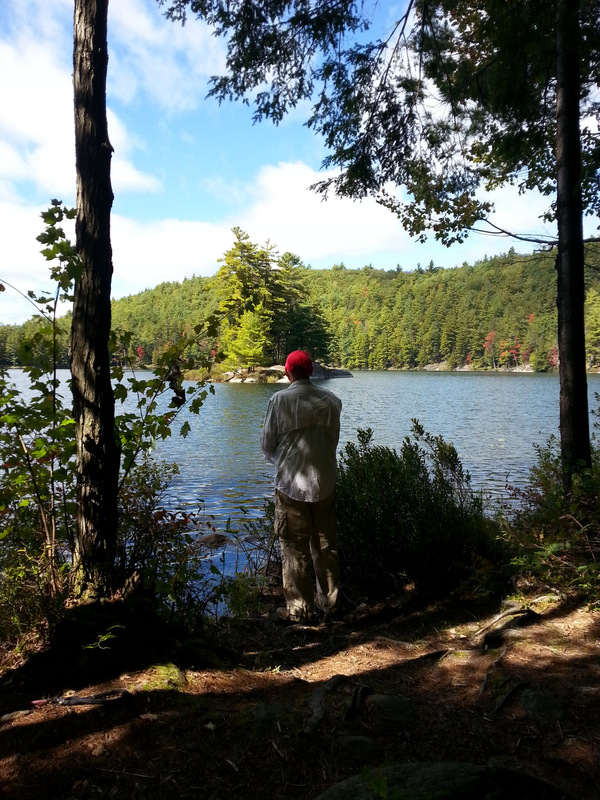 After leaving the Finger Lakes area, we rolled thru the Adirondacks toward Putnam Pond State Park. Some of the hills on the northern edge of the Lakes were huge and long. At one point, as we were lumbering up a mile-long hill, John looked down at the speedometer and noted that we were getting a whopping 4 gmpg! “It’s going to cost us a dollar just to get up this hill”, he commented. What’s going to happen when we really get into the mountains? Guess we’ll find out. 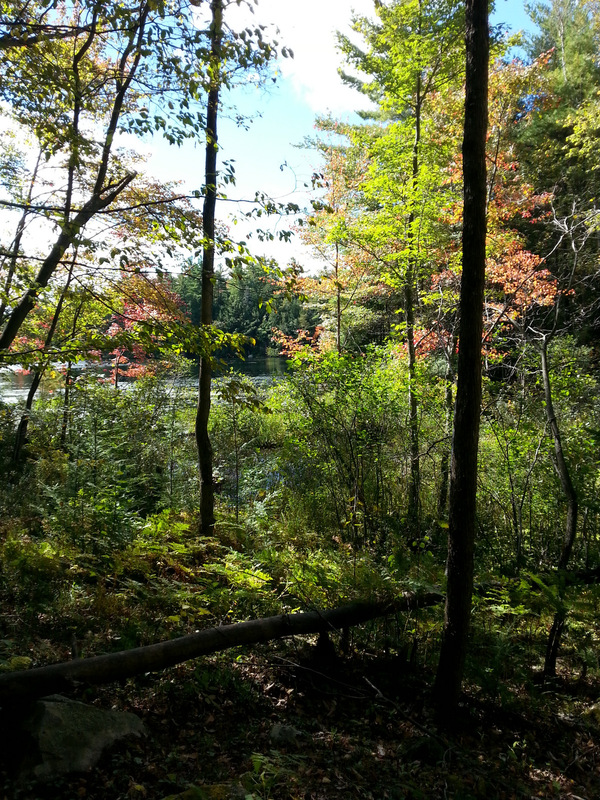 Putnam Pond is incredibly beautiful. We like rustic & remote, and this was right up our alley. The aging facilities were spotless – not hurt at all by the fact that we were one of only two campers in the entire park. Overhead, flocks of geese passed by about every 15 minutes. Must have been thousands that went by in the two days we were there – probably headed to the Montezuma Refuge. We took a long hike, which nearly ended in tragedy. We had been hiking for a couple hours, and determined that we were truly alone in the woods. So, foolishly we let Jezzy off her leash. She would hang with us, and we moved along the trail, climbing and descending, sometimes over a hard rock surface, and other times over deep cushions of pine needles. Suddenly, Jezzy stood up on her hind legs to get a glimpse of something. Like a shot, she tore off thru the woods, her six foot dragging behind her, still attached to her bright red harness. John and I looked at each other dumbly, then he took off after her, saying “you stay on the Trail”. I could hear her high-pitched excited bark occasionally, quickly moving away. Could also hear John’s “Jezzy, come!” also quickly receding in the thick woods. After 20 minutes or so, I could hear nothing. I called out a few times, and started to count loudly, hoping to give John a sense of where I was. Nothing. Such a feeling of hopelessness and despair – you cannot imagine. Another 10 minutes went by, and I could hear something – John, but no Jezzy. John was pretty dirty – he had slid down an embankment in his pursuit. He felt we should go back to the spot where Jezzy first took off, so we went about 200 yards back down the trail. Less than a minute later, as we were trying to get our heads around the situation, Jezzy came crashing thru the brush – her harness and leash gone somewhere, but her collar and id tags still firmly attached. She was thirsty, but quite unaware of the emotional turmoil she had caused. Lesson learned….she will NEVER EVER get off-leash again. Ever. We’ve moved onto Rogers Rock State Park, just 20 miles or so down the road, just a few miles from Ticonderoga (or Ti, as we now call it). 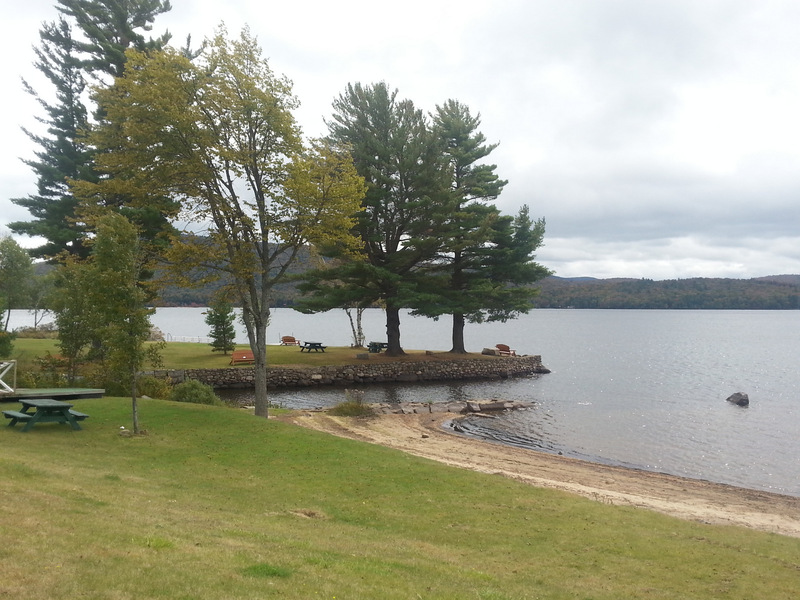 We’ve got a campsite right on Lake George, with our own private patio on the beach. Still no cell service or electric power, but a spectacular site. Again, we are nearly the only campers in this 250 site park. As we sat outside during cocktail hour our first evening, we saw a “loaded” cyclist ride into a campsite nearby. Loaded cyclists are those who are carrying all their gear on the bike while traveling, either in panniers (saddlebags) or pulling a small trailer. Curious to hear her stories, we invited her over in the evening, and again for breakfast. 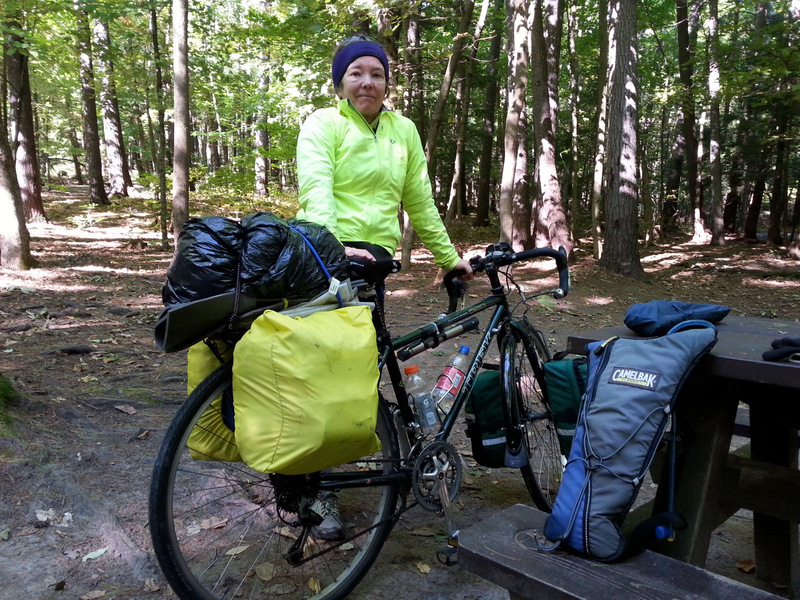 Beth was completing her first solo tour – cycling around the Adirondack area for a week. After breakfast, she headed to Ti to catch the ferry to Vermont, where her car was parked. Then home to New Hampshire, and her job as a hospice nurse. Gritty and gutsy. Good show. 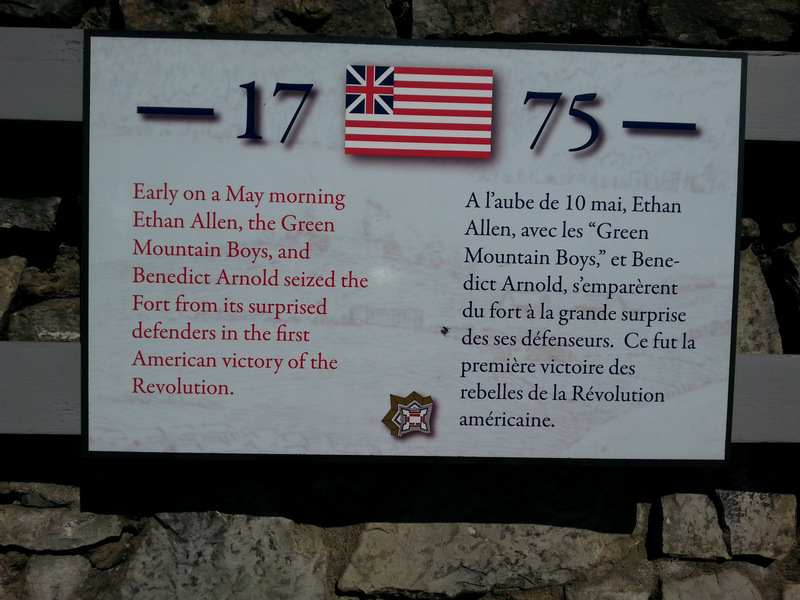 Yesterday was a cycling trip up to Ft. Ticonderoga – site of the first victory for the Americans over the British in the Revolutionary War by Ethan Allen and the Green Mountain Boys. 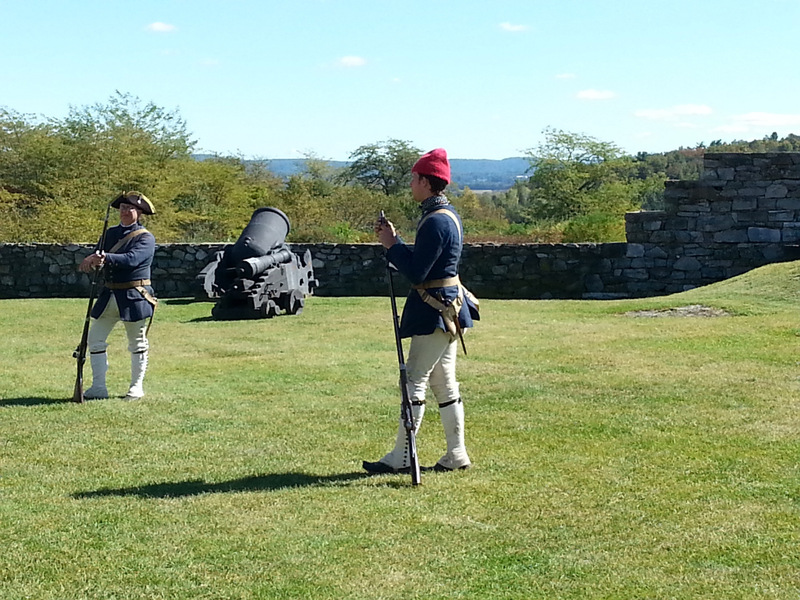 Interesting displays and a stunningly beautiful site. Today, we’re crossing into Vermont. Hope to find phone service along the way somewhere to post, and to check in with family. 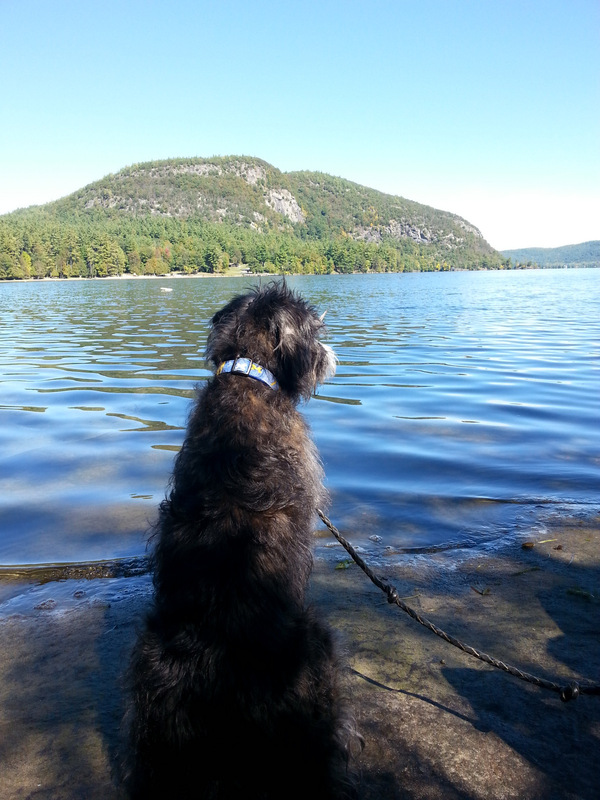 This entry was posted in camping, dogs, great outdoors, hiking, New York, pets, retirement, RV life, simple camping, T@DA and tagged camping, cycling, dogs, hiking, historic sites, retirement, road trip, RV life, simple camping, T@DA, the great outdoors by Judy Crankshaw. Bookmark the permalink. Wonderful scenery, and I’m glad that everything worked out OK as far as your puppy returning! Thanks. That was as stressful of a day as I’ve ever had in my life. What gorgeous country! I loved your descriptions and almost felt like I was trailing right behind you. My heart almost stopped when I read about Jezzie’s caper, and I was on pins and needles until I read that she was okay. The photo of her is priceless. I am especially enjoying your blog this trip. I also love rustic camping, especially when the facilities are clean. I would still be patrolling the NY woods if she hadn’t returned. She recovered rapidly, as evidenced by the Lake George photo. What a gorgeous journey you’re taking. I can’t imagine what fear you must have felt when Jezzie and John took off. So glad you’re all safe. If I remember Vermont well, you’ll be seeing many more hills and curvy roads and sudden scenes of indescribable beauty. Enjoy every moment. A dog’s sense of smell is 20 times more powerful than yours. Jezzy had your smell the whole time!! She wasn’t lost. Ron, she was probably two miles away before she gave up the chase in very thick woods. As you well know, she’s no Lassie. Did you ever figure out what she was chasing? Aren’t you glad it wasn’t a skunk. We figured it was probably a deer, since it obviously kept running, and she was unable to catch it. I still get the willies thinking about her getting ensnared with her harness/leash. Never again.